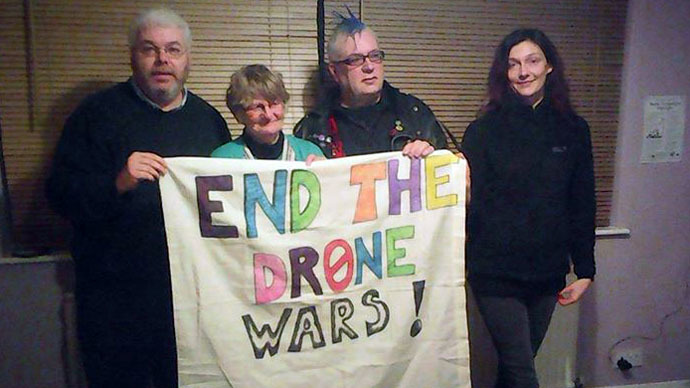 Four peace activists were arrested at a Royal Air Force (RAF) base in Lincolnshire, northern England, on Monday while protesting against Britain’s use of armed drones. The site hosts the control center for UK drones abroad. The group, which goes by the name End the Drone Wars, also brought reports documenting civilian casualties resulting from airstrikes in Iraq and Afghanistan to the site of the demonstration. Behind the rebranding of war, lies a brutal reality where civilians are maimed and killed, communities are destroyed, and trauma lingers for a generation, End the Drone Wars said on Monday. The anti-war group said the four activists arrested were Katharina Karcher, 30, from Coventry, Gary Eagling, 52, from Nottingham, Chris Cole, 51, from Oxford and Penny Walker, 64, from Leicester. As a result, war has been rehabilitated and is accepted “as virtually normal by those who see little or nothing of the impact on the ground thousands of miles away,” it warned. 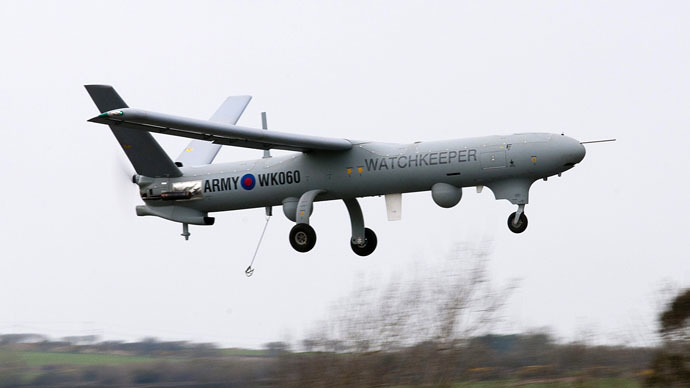 End the Drone Wars emphasized in its statement the RAF’s outpost in Waddington was targeted because it amounts to the hub of drone warfare in Britain. The group says it is yet to hear from the activists being detained by Lincoln Police. Britain has thus far only deployed armed drones in Afghanistan, but RAF forces have also flown American drones in Iraq and Libya. Civilian drone deaths in Afghanistan increased threefold in 2013, according to a UN report. The report, conducted by the United Nations Assistance Mission in Afghanistan (Unama), found that drone strikes accounted for over 33 percent of all civilian deaths from air strikes in 2013. The American administration has used armed drones in Afghanistan, Iraq, Pakistan, Yemen, Somalia and Libya, while Israel has used armed drones in Gaza and possibly Sudan and Egypt. There have also been unconfirmed reports of American drone strikes in the Philippines and Mali. Airstrikes by Britain, the US and other states against Islamic State (IS, formerly ISIS/ISIL) targets in Iraq and Syria are virtually absent from the mainstream press other than the odd story born of carefully crafted Ministry of MoD and Department of Defense (DoD) press statements. Following a Freedom of Information (FOI) probe last year, the MoD refused to specify precisely how many Reaper drones Britain had redeployed from Afghanistan to combat IS. Investigative Journalist Chris Woods, who monitors and details airstrikes occurring in Iraq and Syria, estimates at least 100 non-combatants may have perished since the US-led coalition began targeting IS in the crisis-ridden states.